The UN World Food Program (WFP) aids for the restricted Syrian civilians in Deir Ezzor city have landed mostly in ISIS controlled territories, a source in the city’s administration said Thursday. 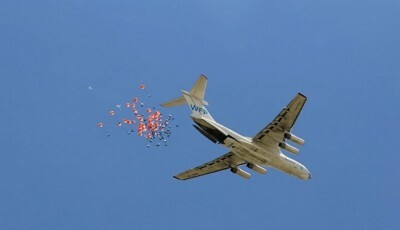 Earlier on Thursday, the United Nations said that the WFP had dropped 21 tons of aid into the city on Wednesday. The contents of the containers that landed on the government-controlled territory has been badly damaged due to a parachute system failure, the source added. According to earlier reports, the WFP has issued a statement admitting difficulties with the operation, adding that necessary adjustments are being carried out. Some 200,000 people living under the ISIS-imposed siege in Deir Ezzor are experiencing severe water shortages and a total lack of electricity, according to the United Nations. Russia has also been providing humanitarian aid to the Syrian people, including through joint efforts with the Syrian government, particularly in Deir Ezzor, reported by Sputnik.